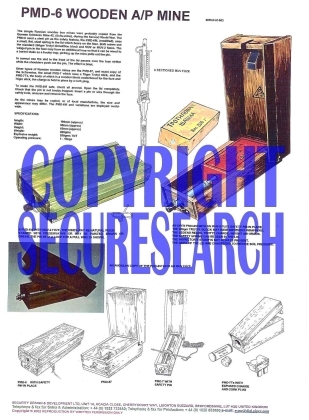 This security poster illustrates the PMD-6 Wooden Russian Anti-Personnel Mine. The mine is made from a wooden box body that allows local manufacture. The explosive charge fitted inside the main body has a fuze fitted into a slot between the upper and lower body. This security poster features the technical specifications of the PMD-6 Wooden Anti-Personnel Mine, an opened PMD-6M with an MUV fuze safety pin in place, a PMD-6M with MUV-2 fuze that shows the pin with a loop for pull wire, a photograph of an Angolan copy of the PMD-6M with an MUV fuze, and a sectioned MUV fuze. The security poster also displays illustrations of the PMD-6 with safety pin in place, a PMD-57, a PMD-7 with a safety pin, and a PMD-7Ts with exposed charge and cork plug. An opened PMD-6M with an MUV fuze safety pin in place alongside a list of variations within the mine. A PMD-6M with MUV-2 fuze that shows the pin with a loop for pull wire. A photograph of an Angolan copy of the PMD-6M with an MUV fuze. Illustrations of the PMD-6 with safety pin in place, a PMD-57, a PMD-7 with a safety pin, and a PMD-7Ts with exposed charge and cork plug. The technical specifications of the PMD-6 Wooden Anti-Personnel Mine. This security poster features the technical specifications of the mine, an opened PMD-6M with an MUV fuze, a PMD-6M with MUV-2 fuze, a photograph of an Angolan copy of the PMD-6M, and illustrations of the PMD-, a PMD-57, a PMD-7, and a PMD-7Ts.